Cinderella Magic Escape info about the game-Games2Rule. The game is about Well-known classic folk tale, Cinderella. After Cinderella�s stepsisters went out to party. Cinderella cried in despair and decides to take part in the party by escaping from the home magically. 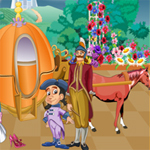 Collect needed objects and hints to help Cinderella to make an escape from home. Good luck for magical escape.